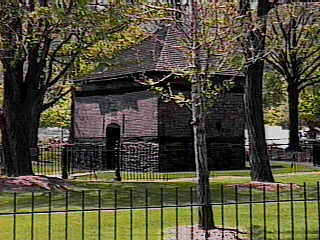 Blockhouse at Point State Park as it appears today. "As the conquest of this country is of the greatest consequence to the adjacent provinces, by securing the Indians our friends for their own advantage, I have therefore sent for their head people to come to me, when I think, in few words and a few days to make everything easy." The chief reason why the French abandoned Fort Duquesne, was because their Indian allies who had been instrumental in defeating Braddock in 1755 removed from the area. By the time the army of General Forbes had reached within striking distance all of the Indian allies had deserted Fort Duquesne. "I shall be obliged to leave about two hundred men of your provincial troops to join a proportion of Virginians and Marylanders, in order to protect this country during winter, by which time I hope the provinces will be sensible of the great benefit of this new acquisition, as to enable me to fix this noble, fine country to all perpetuity under the dominion of Great Britain. "I beg the barracks may be put in good repair and proper lodging for the officers, and that you will send me with the greatest dispatch, your opinion how I am to dispose of the rest of your provincial troops; for the ease and convenience of the provinces and inhabitants. You must also remember. that Col. Montgomery's battalion of one thousand three hundred men and four companies of Royal Americans, are, after so long and tedious campaign, to be taken care of in some winter quarters." The name for the fortification which it was intended to build after the place was secured, had been determined upon before that event occurred. With one accord the name of Fort Pitt was applied to the intended fort. Pittsburgh, as the name of the place, appeared the next day after its occupancy. On November the 26th, Forbes in reporting the capture of the place to Lieutenant-Gov. Denny, in the letter which we have already quoted, dated it from Fort Duquesne, "or now Pitts-Bourgh." Gen. Forbes immediately began the erection of a new fort near the site of the old one. The work was proceeded in with all possible activity. It was getting late in the season. The enemy had withdrawn, it is true, but their whereabouts were not definitely known. Most of them had gone up the river to Fort Machault; some of them had gathered at the stronghold at Loggstown, down the Ohio. The post was watched by spies and Indians, and thus the situation was not one of absolute confidence or security. The character of the structure and the location of the new fort were probably determined upon before Forbes left on his return for Philadelphia, which he did on the 3d of December. The work was located on the bank of the Monongahela at the south end of what, later, was West street in the city of Pittsburgh, and between West street and Liberty, within two hundred yards of Fort Duquesne. It has been described as "a small square stockade, with bastions." It was intended only for temporary use, and for the present accommodation of a garrison of two hundred men. With this number, when it was completed, Col. Hugh Mercer, was placed in command; and the army marched back to the settlements. The fort, so called, was completed probably about the first of January, 1759. Col. Mercer, under date of January 8, 1759, reported the garrison to consist then of about two hundred and eighty men, and that the "works" were capable of some defense, though huddled up in a very hasty manner, the weather being extremely severe. On March the 17th, 1759, the garrison is reported as follows: Royal artillery, eight; Royal Americans, twenty; Highlanders, eighty; Virginia regiment, ninety-nine; First Batt'n Penna., one hundred and thirty-six; Second Batt'n Penna., eighty-five. This structure, as stated, was intended for temporary use only. The one to succeed it was intended to be an imposing fortress and such as would last for all time. Work was expected to be begun upon it within the coming year. General Forbes having died, March 13th, 1759, shortly after his return to Philadelphia, was succeeded by General John Stanwix as commander of His Majesty's regular troops, and those to be raised by the Provinces, for the Southern Department. The announcement of the appointment of Stanwix and of the death of Forbes, was made by Gen. Amherst, Commander-in-Chief, on the 15th of March, 1759. During the early summer of 1759, the greatest apprehension was felt on account of the project which the French had in view, of descending from Fort Machault for an attack on Fort Pitt. A large force was collected there, which, if circumstances had not intervened to divert their operations, would probably have been adequate to capture the place. But the urgent necessity of the French at Niagara, which place was invested by the English, compelled them to abandon their project. Around the garrison at this time many Indians had collected who were now the dependents of the English, being brought thither upon invitations to attend conferences and councils, of which there had been several since the English occupancy of the place. The treaty of July, 1759, was attended by great numbers. These had to be fed, nor did they show indication of departing so long as there was a sufficiency of provisions. General Stanwix arrived at Pittsburgh, late in August, 1759, with materials, skilled workmen and laborers, for the purpose, and on the 3d day of September, the work of building a formidable fortification commenced, in obedience to the orders of William Pitt, Secretary of State. Gen. Stanwix remained at Fort Pitt until the spring of 1760. In the fall of 1759 was held a conference with the Indians which was most satisfactory in its results. It was the policy of the English Government, in which it was seconded by the Provinces of Pennsylvania and Virginia, that the officers of the army as well as the authorities of the Provinces should use every effort to conciliate the Indians and keep them on good terms. Accordingly, Colonel Bouquet, representing Forbes, with Col. Armstrong and several officers, George Croghan, Deputy agent to Sir Wm. Johnson, with Henry Montour, as interpreter met with the chiefs of the Delaware Indians, at Pittsburgh, on December 4th, 1758, after their occupancy of the post. At this meeting the Indians were assured of the peaceful intentions of the King of England and his people toward them. Although Fort Pitt was occupied in 1760, it was not finished until the summer of 1761 under Col. Bouquet. It occupied all the ground between the rivers. Its stone bomb-proof magazine was removed when the Penna. Railway Company built its freight depot in 1852. "The work," says Neville B. Craig, "Was five sided, though not all equal, as Washington erroneously stated in his journal in 1770. The earth around the proposed work was dug and thrown up so as to enclose the selected position with a rampart of earth. On the two sides facing the country, this rampart was supported by what military men call a revetment-a brick work, nearly perpendicular supporting the rampart on the outside, and thus presenting an obstacle to the enemy not easily overcome. On the other three sides, the earth.in the rampart had no support, and, of course, it presented a more inclined surface to the enemy-one which could be readily ascended. To remedy, in some degree, this defect in the work, a line of pickets was fixed on the outside of the foot of the slope of the rampart. Around the whole work was a wide ditch which would, of course, be filled with water when the river was at a moderate stage. In summer, however, when the river was low the ditch was dry and perfectly smooth, so that the officers and men had a ball-alley in the ditch, and against the revetments. "The redoubt, which still remains near the point, the last relic of British labor at this place, was not erected until 1764. The other redoubt, which stood at the mouth of Redoubt Alley, was erected by Col. Wm. Grant; and our recollection is, that the year mentioned on the stone tablet was 1765, but we are not positive on that point." "When Gen. Stanwix left Fort Pitt there were present as a garrison seven hundred, namely, one hundred and fifty Virginians, one hundred and fifty Pennsylvanians and four hundred of the First Battalion of Royal Americans." The war between England and France having terminated to the advantage of the English by the surrender of Montreal, the last post held by the French, on 8th of September, 1759, the English in the fall of 1759 and in 1760 took possession of the surrendered posts.